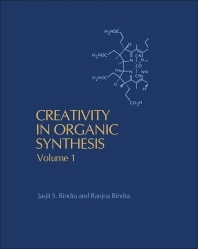 Creativity in Organic Synthesis discusses some of the outstanding accomplishments of natural products synthesis. It presents each synthesis using structural formulas and easily readable flowcharts. Each synthesis is preceded by a brief introductory paragraph. The book notes that synthesizing complex organic molecules occupies an important place in the repertoire of the organic chemist. It looks at new synthetic methods and reactions, characterized by exquisite selectivity and stereochemical control in natural products synthesis. The book uses three-dimensional formulas and perspective drawings in order to illustrate the force of arguments predicting the selectivity or stereochemical outcome of key reactions. This book serves as a guide to the selection of proper reagents and reaction conditions and as a valuable source of model transformations. To the practicing chemist, the book should provide a wealth of information on selective transformations. To the student of organic chemistry, it provides an excellent opportunity to study the subject and its application.